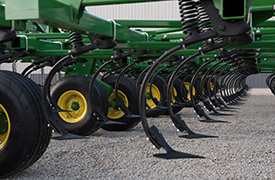 ProFinish Leveling System offers wide range of rear harrows to meet agronomic needs. 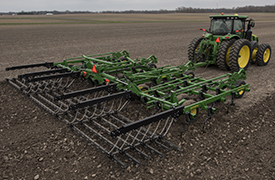 The 2230FH Floating Hitch Field Cultivator offers superior ground-hugging capability with precise depth and pressure control across all types of terrain. 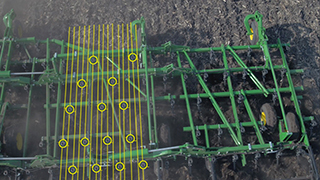 The floating hitch frame design enables this field cultivator to work independently of the tractor and follow the contour of the ground so the implement remains level. The 2230FH commands consistent depth from front to back and from side to side. 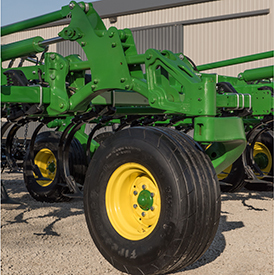 Front-mounted active-hydraulic castering depth-control wheels come standard on the 2230FH Floating Hitch Field Cultivator’s centerframe and wings. These active-hydraulic castering wheels rotate a full 360 degrees and provide good stability at the front of the implement and facilitate excellent turning, reducing tire scuffing. The active-hydraulic castering wheels can be manually adjusted with a turnbuckle. TruSet™ with side-to-side leveling capabilities also enables operators to individually control wing depth and the castering wheels from the cab while on the go. At 16-km/h (10-mph) working speeds, the 2230FH can cover up to 34 hectares (84 acres) per hour enabling producers to size their implement for their unique productivity and agronomic needs. The 2230FH is available in sizes ranging from 7.8 to 21.2 m (25 ft, 6 in. to 69 ft, 9 in.). Horsepower requirements range from 19.6-29.4 kw/m (8 to 12 hp-ft), depending on the soil, depth, and speed. The 12.95-m (42-ft, 6-in.) 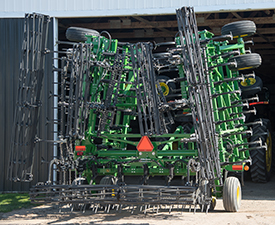 2230FH folds like a five-section implement, but operates like a three-section implement. A small wing is added to these implements. This allows them to have an extra fold to achieve the tight and narrow transport dimensions. When the implement is unfolded for operation, the small, outer-wings lock rigid to allow for three-section operation. Another advantage of the low-transport models is operation in uneven terrain. The low-transport models allow for the rigid wing to follow the contour of the ground. 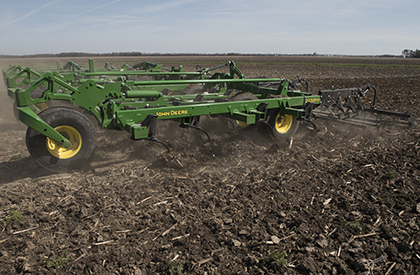 Bolt-on, knock-on, and s-tine sweep options are available to customize the 2230 Field Cultivators to perform well in a variety of field conditions. *NOTE: S-tine sweeps not available for all 2230 configurations. The high-productivity sweeps are available bolt-on and the knock-on Perma-Loc versions. They fit all 47-degree standards with 44-mm (1.75-in.) hole spacing and 11 mm (0.4375 in.) that currently take Tru-Width sweeps, both John Deere and other makes. Perma-Loc sweeps have the advantage of using a Tru-Width™ design for penetration, residue flow, and long life. 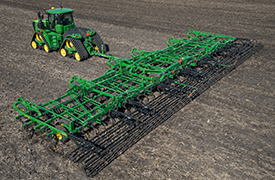 The proven 47-degree sweep angle minimizes soil slabbing yet promotes soil movement. The narrow stem enhances excellent soil and residue flow. Stem geometry ensures soil flow over the spring access opening, effectively separating and lifting flow to a point higher on the shank. The force of soil flow is reduced on the shank, improving shank life. Tru-Width sweeps with the Perma-Loc adapter can seamlessly move the high-productivity sweeps. 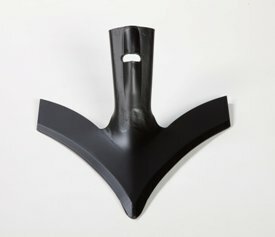 The high-productivity sweeps uses the current Perma-Loc adapter for 47-degree curved standard, N237614. On 2.7-m and 3.4-m (9-ft and 11-ft) center frames: 134 in. On 4.6-m (15-ft) center frames: 164 in.